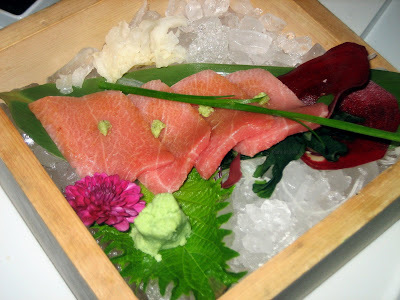 I still haven't posted the photos for Katsuya in Studio City because I am really behind. Since I liked the sushi there, I thought that the Brentwood location would be about the same. Unfortunately... that is so NOT true. The Brentwood location is NOTHING like the Studio City location. I guess I didn't hear or Burumun didn't tell me that this location was more of a Robata bar. Q-bear and I sat at the Robata bar. It was extremely crowded on Saturday, as most places in LA would be. Valet was $6, which only added to how expensive this place was. The decor was very modern and sort of club like. You can barely hear yourself think when you're inside. The menu was very limited so I tried to pick out the better sounding sushi. 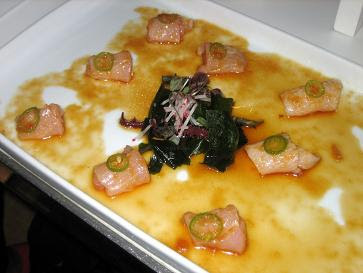 I decided to get the Yellowtail Sashimi with Jalapeno, which you can never really go wrong. It's not anything special because everywhere carries this dish. The portion was pretty tiny for $18. I thought the sauce was tasty, but the presentation was lacking. If they give you such small portions, then use a smaller plate! That way it won't seem like there's tons of empty space to remind you how little they give you. It was good, but definitely NOT worth $18. 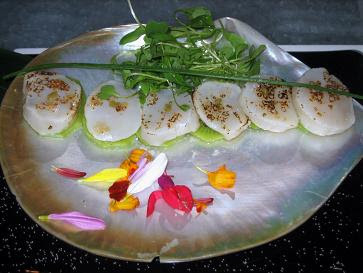 One thing that I thought was unique was the Sliced Kiwi Scallop with Yuzu Vinaigrette. At first I thought it said kiwi scallops, as if that was a type of scallop. 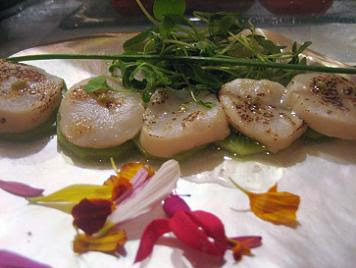 They gave a generous amount of scallop laid atop thin slices of kiwi. I really liked the infused flavor of Yuzu. The presentation was done beautifully on top of a gigantic shell and then sprinkled with colorful petals to enhance the palette. 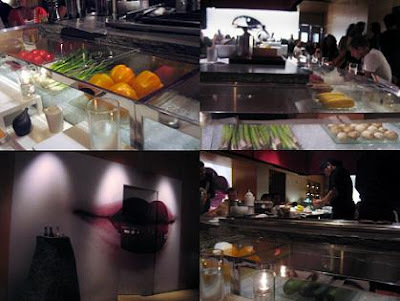 Above is the scallop dish with flash and below is the photo in the dim original lighting of the Robata bar. I decided to try their Toro. The waitress said that they only had Super Toro left and the market price was $10 per piece. I was like, whoa that better be some fabulous toro. If you order Sashimi then it comes with 4 pieces, so I asked how much that would be. I could have sworn she said $30 but later the bill said $36. I decided to not argue and chalk it up to the fact that the place was extremely noisy. The toro was presented nicely on top of ice in a wooden box. It was very colorful and decorative. For good toro, I don't mind paying a lot. What really infuriates me was that I asked if they had fresh wasabi and the server said yes. She brought a nice chunk out and I was extremely delighted they were classy enough to carry it. Then the bill came, she NEGLECTED to tell me that the chunk of fresh wasabi would be FIVE FREAKING DOLLARS! Are you kidding me?????????!?!?!??!?! For that price I could have gotten an order of sushi! That seriously just pissed me off! I might have given this place a descent review had they not gouged me for something so small. I mean seriously, I spend $70 on very little sashimi the least I deserve was some fresh wasabi! Ridiculous! In summation, I am obviously very upset about the whole dining experience. It's WAY over priced and not even that good! If you read all my reviews or know me, money usually isn't a problem for great food and this place obviously did not live up to it's cost. I will NEVER come back to this location. Even though I am furious at how horrible and lame the Katsuya in Brentwood was, I might one day go back to the Katsuya in Studio City. What a dramatic difference location can be. The people who eat in Brentwood and enjoy it there must only be for the ambiance or for the name, because they sure don't know what good food is like! If you want Robata, then you should go to Shin Sen Gumi it's ten thousand times better and CHEAPER! Definitely more authentic.